A parliamentary report of 1777 recorded a parish workhouse in operation in 'Melton Mobray' with accommodation for up to 40 inmates. 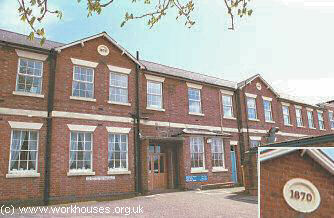 In 1835, there was a workhouse in the town on Back Street. County of Leicester: Ab-Kettleby, Asfordby, Ashby Folville, Barsby, Branston, Brooksby, Buckminster, Burrough-on-the-Hill, Burton Lazars, Coston, Great Dalby, Little Dalby, Dalby-on-the-Wolds, Eastwell, Eaton, Edmondthorpe, Freeby, Frisby-on-the-Wreak, Gaddesby, Garthorpe, Goadby Marwood, Grimston, Harby, Hoby, Holwell, Hose, Kirby Bellars, Long Clawson, Melton Mowbray (3), Nether Broughton, Old Dalby, Pickwell with Leesthorpe, Ragdale, Rotherby, Saltby, Saxby, Saxelby, Scalford, Sewstern, Somerby, Sproxton, Stapleford, Stathern, Stonesby, Sysonby, Thorpe Arnold, Thorpe Satchville, Twyford, Waltham-on-the-Wolds, Wartnaby, Welby, Wycomb and Chadwell, Wyfordby, Wymondham. County of Nottingham: Over Broughton. Later Additions: Bescaby (from 1858), Shoby (from 1858), Sysonby with Eye Kettleby (from 1894). The population falling within the Union at the 1831 census had been 17,872 with parishes ranging in size from Brookesby (population 10) to Melton Mowbray itself (3,356). The average annual poor-rate expenditure for the period 1833-5 had been £9,433 or 10s.7d. per head of the population. 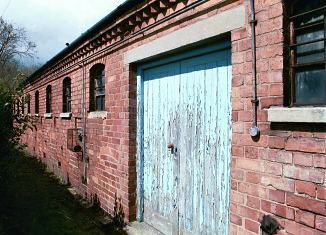 Melton Mowbray entrance block from the west, 2001. An infirmary designed by RW Johnson was erected at the east of the workhouse in 1869-70. At the centre were a surgery. kitchen, and nurse's quarters. Male and female patients had separate entrance to each side. Melton Mowbray infirmary from the north-west, 2001. 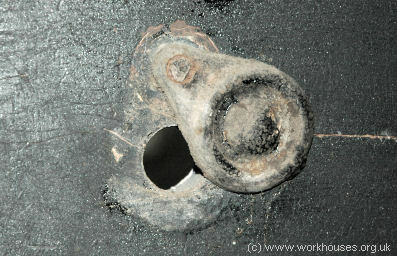 A vagrants' block was located at the south of the workhouse. 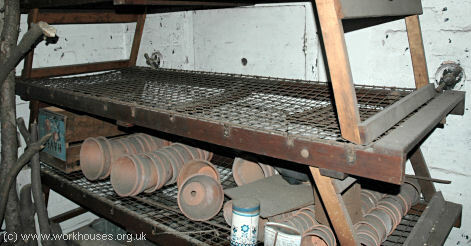 It contained work cells for stone-breaking at the southern side. 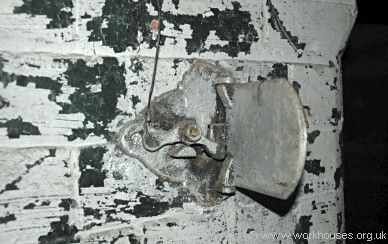 The cells walls contained outlet grids (now bricked up) through which were placed the small pieces of broken stone. Melton Mowbray vagrants' block from the south-east, 2001. 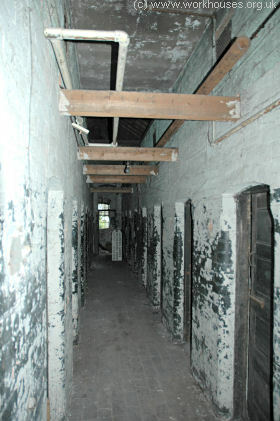 Melton Mowbray vagrants' block interior, 2005. Melton Mowbray vagrants' bedsteads, 2005. The former workhouse later became St Mary's Hospital. The Record Office for Leicestershire, Leicester and Rutland, Long Street, Wigston Magna, Leicester, LE18 2AH. Holdings include: Guardians' minutes (1855-8, 1927-30); Births register (1836-1913, with gaps); Deaths (1836-47); Creed registers (1877-1931); Admissions and discharges (1924-27); etc.